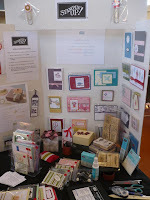 The Upper Hutt Craft Market is on again this weekend, so I have been busy creating some goodies to display and sell. 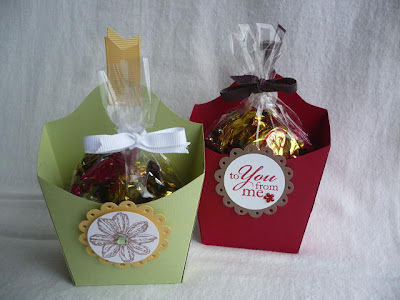 I made these "Chocolate" chip cartons and just had to share them. They are so cute!! 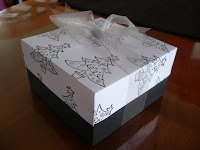 What a great idea for an alternative Christmas or Birthday box!! I would love to share with you how these are made! 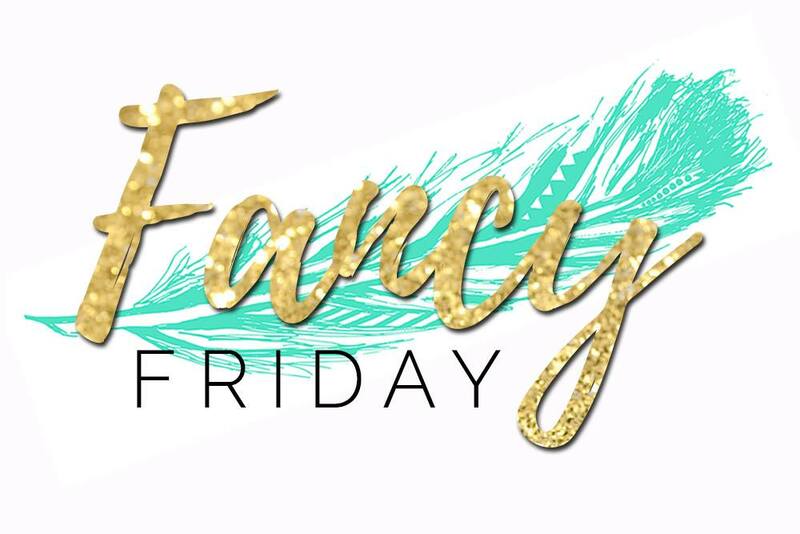 Contact me to book a workshop and get ready to impress your friends! This would have to be one of my favourite SU sets at the moment. It is called Organic Grace. You cannot buy this set, but by getting together with a few of your friends - you could earn it for free with a qualifying workshop!! Email me to book your own workshop. I made this card especially for a friend who is going through a pretty rough time, but always has the time to stay in contact with me. I really hope she likes it! Wow, I have had sooo many challenges to complete this month, my head is spinning!! 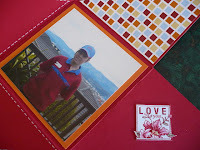 My lovely Upline, Jacque, set a scrapbooking challenge for the team this month!! My first reaction was - OH NO!!! 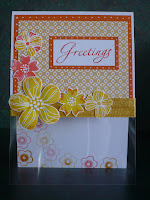 I confess to being a card maker, not a scrapbooker! This really was quite a challenge for me, but made me think outside the box, and really get creative. I must say, I am really pleased wth the results!! Instead of doing the usual scrapbook layout, I decided to make things interesting by doing a "Squash Book". Having never done one before, I had a lot of fun putting it together. In fact, I have decided to run a class on this snazzy little book on the 24th October. Feel free to contact me for details of this class, if you are interested in attending! I just don't know where this year has gone! It seems the older I get, the faster time flies. I feel like Christmas has just been, but we are only 3 months away from it happening all over again! With that in mind, I held a class yesterday to help people be at least a bit prepared. A Box to hold a lovely little gift, a matching mini rosette ribbon to decorate the top, and a card and envelope to go with it all. This is the result. 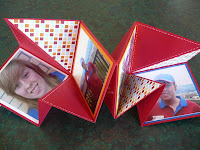 These projects are all very simple to make, come together quickly, but still have that WOW factor! This is a very economical project too! 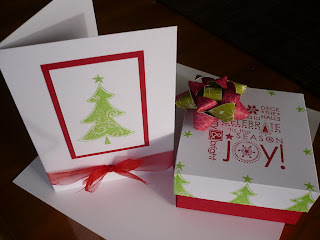 The card and box were made using only one A4 sheet of Whisper White and an A4 sheet of Real Red! 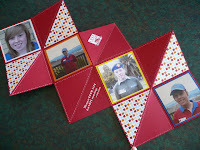 The card was then made out of the offcuts. No waste at all! I like that. The weather is getting warmer, the days longer. There is a definite feel of spring in the air. I am sooo glad the worst of winter is behind us. It is lovely to see the blossoms on the trees. 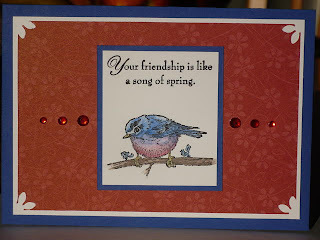 So keeping with the spring theme I have designed two cards using the Stampin' Up! Spring Song stamp set. This is a gorgeous and (I think) quite elegant set, and at only $30.95 for a set of three stamps - great value. The artwork is just stunning, which is great if you don't want to spend the time drawing something yourself!! 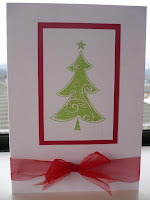 Add a blender pen and Stampin Pastels, and you can create a lovely piece of art work in quick time!! 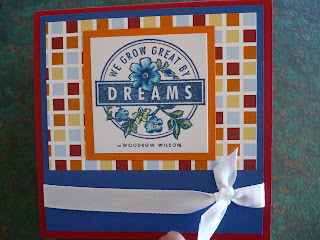 Now that the crafters market is behind me, I have made a concerted effort to play with all my lovely Stampin' Up! toys. At each workshop I hold, I like to make sure some lucky guest will go away with a little something extra. 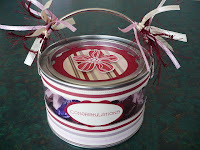 I found these sweet little tins that were just begging to be dressed up and altered! I was very pleased with how it turned out and so was the lovely lady who won the door prize! I think the chocolate inside had something to do with it as well! I received the "Organic Grace" stamp set last week and haven't had a chance to play with it, so decided this morning to come up with an idea for the gorgeous stamps. I am really pleased with how it turned out! 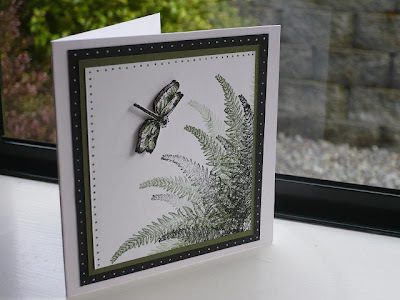 Using only the fern and dragonfly out of the set, I wanted to keep it simple and not overcrowd the card, as I sometimes like to do! I stamped the wings of the dragonfly on to acetate and bent them slightly once on the body of the dragonfly. I think it makes the dragonfly look like it is really flying! 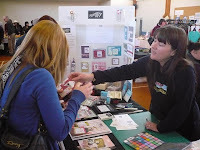 I had my first display at our local Crafters Market, here in Upper Hutt. It was fairly quiet though, with the Spring Festival on in the main Street at the same time!! It was such a beautiful day that everyone in town wanted to be outside not in, where we were! But it was a great experience for me, since I have never done anything like this before. I learnt a few things about what sells well and what doesn't, as well as, how best to display things. I think I went a bit over board, and will trim things down a bit next month!! The table size was a wee bit smaller than I thought it would be! I also need to paint my display board black, so the lovely cards will stand out a bit more, I think. 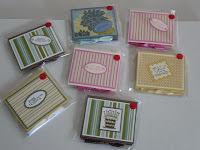 I did sell some of my cards and a couple of Post-it-Note holders I had made up. 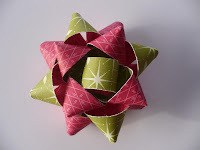 I also had some of the lovely little boxes I had been practising on there to display. My fliers went home with quite a few people, so all things considered, I was very happy with how the day went. Bring on the next Market Day!! has been a rollercoaster ride to say the least!! 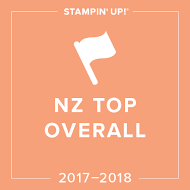 When I got my starter kit from Stampin' Up! it was just like Christmas! So many goodies to look at and play with. 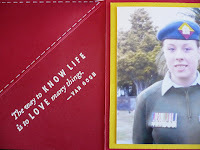 I have a wonderful manager in Jacque P, and while she lives in Auckland, has been a tremendous support to me. 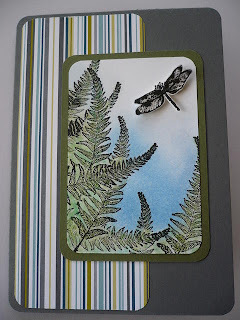 I came first in only the secound card challenge I have ever entered, which was a great thrill. 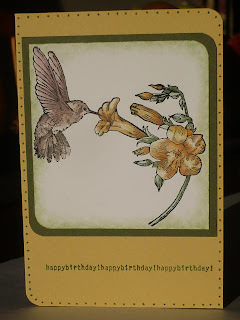 This card was to represent the lovely colours of spring. 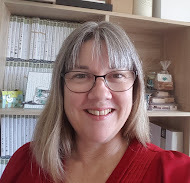 I have also spent hours practising and practising the lovely creations I can demonstrate in workshops for the lovely ladies that have held them. They are sooo much fun. 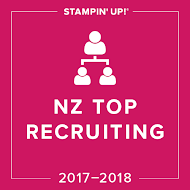 I don't know why I hadn't come across Stampin' Up! before now! But I am really glad I have had the opportunity to join this fantastic business. For my next scheduled workshop, we are going with a Christmas theme. Yes, Christmas! 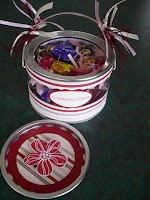 It is fast approaching and we are going to make lovely boxes to put all our goodies in. 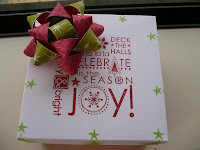 These boxes are so easy and fun to make. I can't wait to show everyone how they are done.